On our Yosemite Hotel 2-Day Tour, you’ll have enough time and flexibility to see everything the park has to offer. The tour is fully-guided so you get a more complete, personal experience. During your two days, you will see and photograph such famous highlights as Yosemite Falls (the tallest waterfall in North America), El Capitan, Half Dome, Bridalveil Falls, and Inspiration Point. The tour also includes a trip to Glacier Point and a hike among the Giant Sequoias (weather permitting). At night, you will sleep comfortably in the heart of Yosemite Valley at your choice of accommodations (Yosemite Valley Lodge, Majestic Hotel, or Tent Cabins at Half Dome Village), or at Cedar Lodge in the picturesque Merced River canyon. Slip away to Yosemite Park for two days with us! Escape to the mountains for two full days of hiking, sightseeing and exploring in the amazing natural wilderness of Yosemite National Park. Trek through Yosemite Valley, Glacier Point, and the Giant Sequoias (weather permitting), and spend the night in the heart of Yosemite Valley at your choice of accommodations (Yosemite Valley Lodge, Majestic Hotel, Half Dome Village), or at Cedar Lodge along the Merced River. On this tour of Yosemite National Park from San Francisco, you'll have two days to explore, giving you more time and flexibility to see all the sights. Your guide stays in the hotel with the group, providing valuable knowledge of the history of Yosemite and a more personal experience of the park throughout your trip. The two days in Yosemite National Park are divided between time in Yosemite Valley, and exploring the outlying areas of the park. In the valley, you will visit and photograph famous highlights such as Yosemite Falls (the tallest waterfall in North America), El Capitan, Half Dome, Bridalveil Fall, and Inspiration Point. Beyond the valley, you will take a trip to the awe-inspiring Glacier Point and enjoy a hike among the Giant Sequoias (weather permitting). This tour of Yosemite arrives back in San Francisco at approximately 9:00pm on the second day. 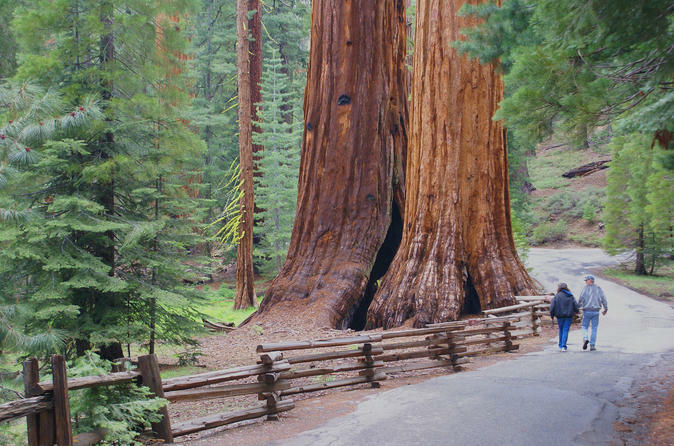 Slip away to Yosemite park for two full days of fun and exploration! See the Itinerary below for more details.